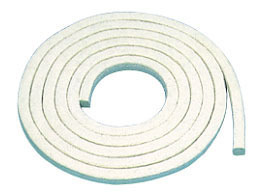 The packing is made of white asbestos fiber cords impregnated with PTFE dispersion. (Addtition of lubricant is operational.) It is soft in texture and suitable as the sealing of pumps for liquidated chemicals. However, packing impregnated with lubricants is reco-mended for use with reciprocating pumps or for the sealing in places where linear velocity is up to 10m/s.